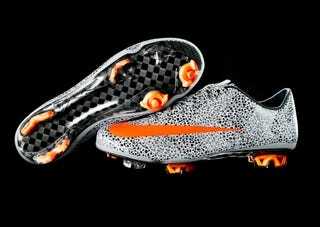 The CR Mercurial Vapor SuperFly II [good grief] makes a statement on pitch and the Safari print expresses my style. Combined with incredibly light and responsive performance the boot gives me everything I need to elevate my game. And anyone spotted wearing these at Sunday League will have their game elevated as well, since they'll spend the entire match being clattered 3 feet into the air at every opportunity.